Known as “Mr. Five Per Cent” for his personal share of Middle East oil production, the Armenian oil magnate and philanthropist Calouste Gulbenkian (1869–1955) was also a savvy art collector. Although his collection has much in common with those formed by equally wealthy American contemporaries such as Henry Clay Frick and William Randolph Hearst, the manner of their acquisition betrayed a “buccaneer” element. 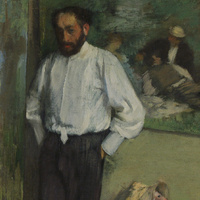 Gulbenkian successfully leveraged his oil interests as well as promises of a bequest to influence the leading American, British and French agents, dealers and curators of the twentieth century. Cultural historian Jonathan Conlin is the author of Mr. Five Percent: The Many Lives of Calouste Gulbenkian, the World’s Richest Man (Profile Books, 2019).